The Revelation of Jesus Christ is a book of prophecy on the end times and comprises the final book of the New Testament and of the Bible. The Greek word for Revelation is Αποκαλυψις or Apocalypse. Revelation always implies the unveiling of something previously hidden, in this case, future events. As the final book of the Bible, the Book of Revelation brings to fruition symbolism found in Genesis 3:15 in the first book of the Bible. Early Christian Tradition identified the writer of Revelation as the Apostle St. John, the Beloved Disciple, while he was in exile on the island of Patmos in the Aegean Sea. Written in symbolism, the book has always been surrounded by mystery and has fascinated mankind throughout the ages as to its meaning. The Apocalypse opens with "The Revelation of Jesus Christ," the prophecy revealed to the Evangelist John by the risen Christ, "who loves us and has freed us from our sins by his blood" (1:5). The Book of Revelation is at once frightening, as it speaks of the rise of the evil one, the Great Tribulation, and the end of the age; dramatic as it describes the final battle of good and evil; and, above all, optimistic, as it points to the triumph of Jesus Christ over evil and the dawn of a New Creation. Revelation 1:19 sets three time periods to the book - what you have seen, what is now, and what will happen afterwards. The first time period records the vision of the Son of Man (Revelation 1:10-20). The second time period includes the messages to the Seven Churches, Chapters 2 and 3, in which the word repent - μετανοέω or metanoew - occurs seven times. The third time period comprises the future (4-22), which presents a split-stage effect, offering scenes of both heaven and earth. Chapter 4 begins scenes of heavenly worship, which are interspersed throughout and provide continuity to this intriguing text but also offer contrast to the terrifying images during the Tribulation on earth (7:14). The heavenly worship recalls the Mass or Divine Liturgy, the renewal of the New Covenant in Christ. Hope is offered to those who are faithful to the Lord and his Commandments. Those who endure for Christ will be kept from the hour of trial that will fall on the whole world to test the inhabitants of the earth (Revelation 3:10). Angels are instructed not to harm the earth until the servants of God are sealed on their foreheads (7:3). Spirits from the abyss are to torment only those who do not have the seal of God on their foreheads (9:4). "Here is a call for the endurance of the saints, those who keep the commandments of God and hold fast to faith in Jesus" (14:12). The Revelation to John often reflects imagery found in Hebrew Scripture, our Old Testament of the Bible, such as the Books of Job, Daniel, and Ezekiel. For example, the Son of Man in Daniel 7:13 is referenced in Revelation 1:13 and 14:14. Jesus calls himself the Son of Man in all Four Gospels, fulfilling the destiny of the Messianic figure in the Book of Daniel. 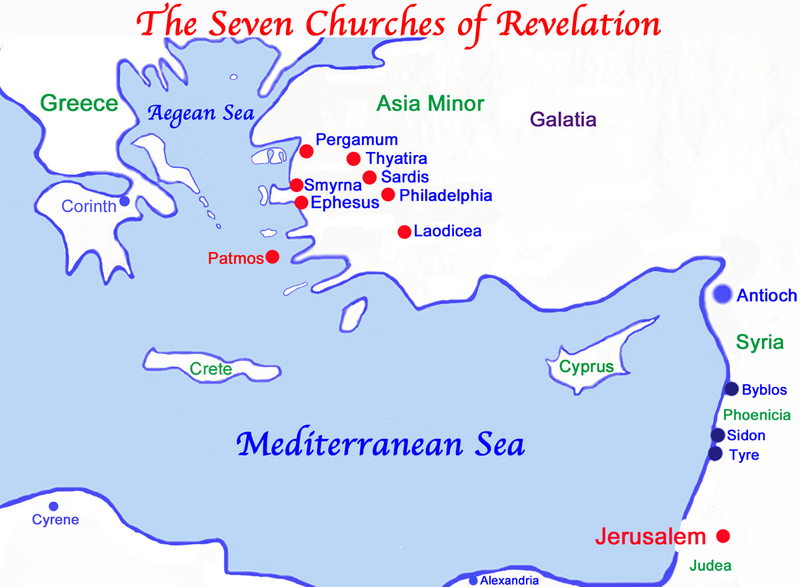 The number seven resounds throughout Revelation and often serves as a key to important events. There are the seven Churches, and the seven seals, trumpets, and bowls. There are the seven angels who stand before the Lord (8:2). One also speaks of the seven Blessings or Beatitudes - μακáριος or makarios - of Revelation, as found in 1:3, 14:13, 16:15, 19:9, 20:6, 22:7, and 22:14. Following the proclamation of the Kingdom of God (11:15), seven spiritual figures are revealed: the Woman clothed with the sun (12:1); the dragon (12:3), that ancient serpent of Genesis, who is called the devil and Satan (12:9); the male child, destined to rule all nations with an iron rod (12:5); Michael (12:7); the sea beast (13:1); the land beast (13:11), who implanted the mark - χάραγμα or charagma - of the beast; and the Lamb of God (14:1). Angels appear over 70 times in Revelation and play an instrumental role in this prophetic text. Revelation describes the Book of Life and gives a warning about the Day of Judgement. The only ones to enter the New Jerusalem will be those written in the Book of Life of the Lamb (21:27). 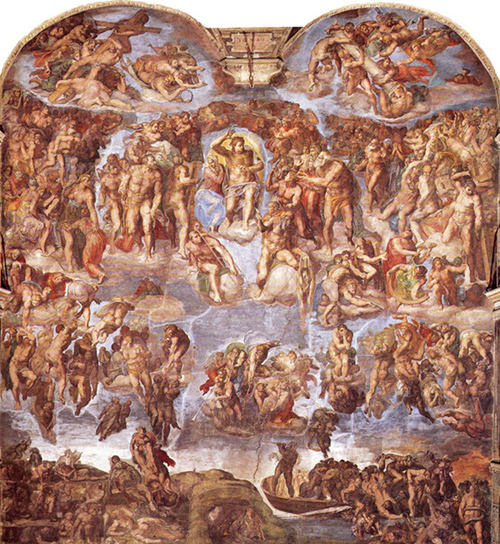 The New Covenant binds together the following four levels of interpretation: There is the Preterist view, which emphasizes a first-century fulfillment of Revelation's prophecies; a Futurist view, which sees Revelation as a timetable for future events on earth, a view which lately has been prominent in the media; an Idealist view, which considers Revelation an allegory of spiritual warfare that every believer must fight; and the Historical view, which takes the vantage point of the Apocalypse laying out God's master plan for history, from beginning to end; one sees the consistent pattern of covenant, fall, judgement and redemption. The following Scripture is from the Authorized King James Version of the Holy Bible, now in the public domain. King James I commissioned a group of Biblical scholars in 1604 to establish an authoritative translation of the Bible from the ancient languages and other translations at the time, and the work was completed in 1611. The original King James Bible included the Apocrypha but in a separate section. A literary masterpiece of the English language, the original King James Bible is still in use today! 1 The Revelation of Jesus Christ, which God gave unto him, to shew unto his servants things which must shortly come to pass; and he sent and signified it by his angel unto his servant John: 2 Who bare record of the word of God, and of the testimony of Jesus Christ, and of all things that he saw. 3 Blessed is he that readeth, and they that hear the words of this prophecy, and keep those things which are written therein: for the time is at hand. and all kindreds of the earth shall wail because of him. Even so, Amen. saith the Lord, which is, and which was, and which is to come, the Almighty. was in the isle that is called Patmos, for the word of God, and for the testimony of Jesus Christ. 10 I was in the Spirit on the Lord's Day, and heard behind me a great voice, as of a trumpet, 11 Saying, I am Alpha and Omega, the first and the last: and, What thou seest, write in a book, and send it unto the seven churches which are in Asia; unto Ephesus, and unto Smyrna, and unto Pergamos, and unto Thyatira, and unto Sardis, and unto Philadelphia, and unto Laodicea. 20 The mystery of the seven stars which thou sawest in my right hand, and the seven golden candlesticks. The seven stars are the angels of the seven churches: and the seven candlesticks which thou sawest are the seven churches. 1 Unto the angel of the church of Ephesus write; These things saith he that holdeth the seven stars in his right hand, who walketh in the midst of the seven golden candlesticks; 2 I know thy works, and thy labour, and thy patience, and how thou canst not bear them which are evil: and thou hast tried them which say they are apostles, and are not, and hast found them liars: 3 And hast borne, and hast patience, and for my name's sake hast laboured, and hast not fainted. 4 Nevertheless I have somewhat against thee, because thou hast left thy first love. 5 Remember therefore from whence thou art fallen, and repent, and do the first works; or else I will come unto thee quickly, and will remove thy candlestick out of his place, except thou repent. 6 But this thou hast, that thou hatest the deeds of the Nicolaitans, which I also hate. 8 And unto the angel of the church in Smyrna write; These things saith the first and the last, which was dead, and is alive; 9 I know thy works, and tribulation, and poverty, (but thou art rich) and I know the blasphemy of them which say they are Jews, and are not, but are the synagogue of Satan. 10 Fear none of those things which thou shalt suffer: behold, the devil shall cast some of you into prison, that ye may be tried; and ye shall have tribulation ten days: be thou faithful unto death, and I will give thee a crown of life. 12 And to the angel of the church in Pergamos write; These things saith he which hath the sharp sword with two edges; 13 I know thy works, and where thou dwellest, even where Satan's seat is: and thou holdest fast my name, and hast not denied my faith, even in those days wherein Antipas was my faithful martyr, who was slain among you, where Satan dwelleth. 14 But I have a few things against thee, because thou hast there them that hold the doctrine of Balaam, who taught Balac to cast a stumblingblock before the children of Israel, to eat things sacrificed unto idols, and to commit fornication. 15 So hast thou also them that hold the doctrine of the Nicolaitans, which thing I hate. 16 Repent; or else I will come unto thee quickly, and will fight against them with the sword of my mouth. 18 And unto the angel of the church in Thyatira write; These things saith the Son of God, who hath his eyes like unto a flame of fire, and his feet are like fine brass; 19 I know thy works, and charity, and service, and faith, and thy patience, and thy works; and the last to be more than the first. 20 Notwithstanding I have a few things against thee, because thou sufferest that woman Jezebel, which calleth herself a prophetess, to teach and to seduce my servants to commit fornication, and to eat things sacrificed unto idols. 21 And I gave her space to repent of her fornication; and she repented not. 22 Behold, I will cast her into a bed, and them that commit adultery with her into great tribulation, except they repent of their deeds. 7 And to the angel of the church in Philadelphia write; These things saith he that is holy, he that is true, he that hath the key of David, he that openeth, and no man shutteth; and shutteth, and no man openeth; 8 I know thy works: behold, I have set before thee an open door, and no man can shut it: for thou hast a little strength, and hast kept my word, and hast not denied my name. 9 Behold, I will make them of the synagogue of Satan, which say they are Jews, and are not, but do lie; behold, I will make them to come and worship before thy feet, and to know that I have loved thee. 11 Behold, I come quickly: hold that fast which thou hast, that no man take thy crown. 12 Him that overcometh will I make a pillar in the temple of my God, and he shall go no more out: and I will write upon him the name of my God, and the name of the city of my God, which is new Jerusalem, which cometh down out of heaven from my God: and I will write upon him my new name. if any man hear my voice, and open the door, I will come in to him, and will sup with him, and he with me. 2 And immediately I was in the spirit: and, behold, a throne was set in heaven, and one sat on the throne. 3 And he that sat was to look upon like a jasper and a sardine stone: and there was a rainbow round about the throne, in sight like unto an emerald. 4 And round about the throne were four and twenty seats: and upon the seats I saw four and twenty elders sitting, clothed in white raiment; and they had on their heads crowns of gold. 5 And out of the throne proceeded lightnings and thunderings and voices: and there were seven lamps of fire burning before the throne, which are the seven Spirits of God. Behold, the Lion of the tribe of Juda(h), the Root of David, hath prevailed to open the book, and to loose the seven seals thereof. Thou art worthy to take the book, and to open the seals thereof: for thou wast slain, and hast redeemed us to God by thy blood out of every kindred, and tongue, and people, and nation; 10 And hast made us unto our God kings and priests: and we shall reign on the earth. 14 And the four living creatures said, Amen. And the four and twenty elders fell down and worshipped him that liveth for ever and ever. 1 And I saw when the Lamb opened one of the seals, and I heard, as it were the noise of thunder, one of the four living creatures saying, Come and see. 2 And I saw, and behold a white horse: and he that sat on him had a bow; and a crown was given unto him: and he went forth conquering, and to conquer. 3 And when he had opened the second seal, I heard the second living creature say, Come and see. 4 And there went out another horse that was red: and power was given to him that sat thereon to take peace from the earth, and that they should kill one another: and there was given unto him a great sword. 5 And when he had opened the third seal, I heard the third living creature say, Come and see. And I beheld, and lo a black horse; and he that sat on him had a pair of balances in his hand. 6 And I heard a voice in the midst of the four living creatures say, A measure of wheat for a penny, and three measures of barley for a penny; and see thou hurt not the oil and the wine. 7 And when he had opened the fourth seal, I heard the voice of the fourth living creature say, Come and see. 8 And I looked, and behold a pale horse: and his name that sat on him was Death, and Hell followed with him. And power was given unto them over the fourth part of the earth, to kill with sword, and with hunger, and with death, and with the beasts of the earth. 4 And I heard the number of them which were sealed: and there were sealed an hundred and forty and four thousand of all the tribes of the children of Israel. 5 Of the tribe of Juda were sealed twelve thousand. Of the tribe of Reuben were sealed twelve thousand. Of the tribe of Gad were sealed twelve thousand. 6 Of the tribe of Aser were sealed twelve thousand. Of the tribe of Nepthalim were sealed twelve thousand. Of the tribe of Manasses were sealed twelve thousand. 7 Of the tribe of Simeon were sealed twelve thousand. Of the tribe of Levi were sealed twelve thousand. Of the tribe of Issachar were sealed twelve thousand. 8 Of the tribe of Zabulon were sealed twelve thousand. Of the tribe of Joseph were sealed twelve thousand. Of the tribe of Benjamin were sealed twelve thousand. 11 And all the angels stood round about the throne, and about the elders and the four living creatures, and fell before the throne on their faces, and worshipped God, 12 Saying, Amen: Blessing, and glory, and wisdom, and thanksgiving, and honour, and power, and might, be unto our God for ever and ever. Amen. 15 Therefore are they before the throne of God, and serve him day and night in his temple: and he that sitteth on the throne shall dwell among them. 16 They shall hunger no more, neither thirst any more; neither shall the sun light on them, nor any heat. 17 For the Lamb which is in the midst of the throne shall feed them, and shall lead them unto living fountains of waters: and God shall wipe away all tears from their eyes. 1 And when he had opened the seventh seal, there was silence in heaven about the space of half an hour. 2 And I saw the seven angels which stood before God; and to them were given seven trumpets. 3 And another angel came and stood at the altar, having a golden censer; and there was given unto him much incense, that he should offer it with the prayers of all saints upon the golden altar which was before the throne. 4 And the smoke of the incense, which came with the prayers of the saints, ascended up before God out of the angel's hand. 5 And the angel took the censer, and filled it with fire of the altar, and cast it into the earth: and there were voices, and thunderings, and lightnings, and an earthquake. 6 And the seven angels which had the seven trumpets prepared themselves to sound. 7 The first angel sounded, and there followed hail and fire mingled with blood, and they were cast upon the earth: and the third part of trees was burnt up, and all green grass was burnt up. 8 And the second angel sounded, and as it were a great mountain burning with fire was cast into the sea: and the third part of the sea became blood; 9 And the third part of the creatures which were in the sea, and had life, died; and the third part of the ships were destroyed. 10 And the third angel sounded, and there fell a great star from heaven, burning as it were a lamp, and it fell upon the third part of the rivers, and upon the fountains of waters; 11 And the name of the star is called Wormwood: and the third part of the waters became wormwood; and many men died of the waters, because they were made bitter. 1 And the fifth angel sounded, and I saw a star fall from heaven unto the earth: and to him was given the key of the bottomless pit. 2 And he opened the bottomless pit; and there arose a smoke out of the pit, as the smoke of a great furnace; and the sun and the air were darkened by reason of the smoke of the pit. 3 And there came out of the smoke locusts upon the earth: and unto them was given power, as the scorpions of the earth have power. but only those men which have not the seal of God in their foreheads. 5 And to them it was given that they should not kill them, but that they should be tormented five months: and their torment was as the torment of a scorpion, when he striketh a man. 6 And in those days shall men seek death, and shall not find it; and shall desire to die, and death shall flee from them. 7 And the shapes of the locusts were like unto horses prepared unto battle; and on their heads were as it were crowns like gold, and their faces were as the faces of men. 8 And they had hair as the hair of women, and their teeth were as the teeth of lions. 9 And they had breastplates, as it were breastplates of iron; and the sound of their wings was as the sound of chariots of many horses running to battle. 10 And they had tails like unto scorpions, and there were stings in their tails: and their power was to hurt men five months. 11 And they had a king over them, which is the angel of the bottomless pit, whose name in the Hebrew tongue is Abaddon, but in the Greek tongue hath his name Apollyon. 12 One woe is past; and, behold, there come two woes more hereafter. 13 And the sixth angel sounded, and I heard a voice from the four horns of the golden altar which is before God, 14 Saying to the sixth angel which had the trumpet, Loose the four angels which are bound in the great river Euphrates. 15 And the four angels were loosed, which were prepared for an hour, and a day, and a month, and a year, for to slay the third part of men. 16 And the number of the army of the horsemen were two hundred thousand thousand: and I heard the number of them. 17 And thus I saw the horses in the vision, and them that sat on them, having breastplates of fire, and of jacinth, and brimstone: and the heads of the horses were as the heads of lions; and out of their mouths issued fire and smoke and brimstone. 18 By these three was the third part of men killed, by the fire, and by the smoke, and by the brimstone, which issued out of their mouths. 19 For their power is in their mouth, and in their tails: for their tails were like unto serpents, and had heads, and with them they do hurt. 1 And I saw another mighty angel come down from heaven, clothed with a cloud: and a rainbow was upon his head, and his face was as it were the sun, and his feet as pillars of fire: 2 And he had in his hand a little book open: and he set his right foot upon the sea, and his left foot on the earth, 3 And cried with a loud voice, as when a lion roareth: and when he had cried, seven thunders uttered their voices. 4 And when the seven thunders had uttered their voices, I was about to write: and I heard a voice from heaven saying unto me, Seal up those things which the seven thunders uttered, and write them not. 5 And the angel which I saw stand upon the sea and upon the earth lifted up his hand to heaven, 6 And sware by him that liveth for ever and ever, who created heaven, and the things that therein are, and the earth, and the things that therein are, and the sea, and the things which are therein, that there should be time no longer: 7 But in the days of the voice of the seventh angel, when he shall begin to sound, the mystery of God should be finished, as he hath declared to his servants the prophets. 8 And the voice which I heard from heaven spake unto me again, and said, Go and take the little book which is open in the hand of the angel which standeth upon the sea and upon the earth. 9 And I went unto the angel, and said unto him, Give me the little book. And he said unto me, Take it, and eat it up; and it shall make thy belly bitter, but it shall be in thy mouth sweet as honey. 10 And I took the little book out of the angel's hand, and ate it up; and it was in my mouth sweet as honey: and as soon as I had eaten it, my belly was bitter. 11 And he said unto me, Thou must prophesy again before many peoples, and nations, and tongues, and kings. 7 And when they shall have finished their testimony, the beast that ascendeth out of the bottomless pit shall make war against them, and shall overcome them, and kill them. 8 And their dead bodies shall lie in the street of the great city, which spiritually is called Sodom and Egypt, where also our Lord was crucified. 9 And they of the people and kindreds and tongues and nations shall see their dead bodies three days and an half, and shall not suffer their dead bodies to be put in graves. 10 And they that dwell upon the earth shall rejoice over them, and make merry, and shall send gifts one to another; because these two prophets tormented them that dwelt on the earth. 11 And after three days and an half the Spirit of life from God entered into them, and they stood upon their feet; and great fear fell upon them which saw them. 12 And they heard a great voice from heaven saying unto them, Come up hither. And they ascended up to heaven in a cloud; and their enemies beheld them. 13 And the same hour was there a great earthquake, and the tenth part of the city fell, and in the earthquake were slain of men seven thousand: and the remnant were affrighted, and gave glory to the God of heaven. 14 The second woe is past; and, behold, the third woe cometh quickly. We give thee thanks, O Lord God Almighty, which art, and wast, and art to come; because thou hast taken to thee thy great power, and hast reigned. 18 And the nations were angry, and thy wrath is come, and the time of the dead, that they should be judged, and that thou shouldest give reward unto thy servants the prophets, and to the saints, and them that fear thy name, small and great; and shouldest destroy them which destroy the earth. 10 And I heard a loud voice saying in heaven, Now is come salvation, and strength, and the kingdom of our God, and the power of his Christ: for the accuser of our brethren is cast down, which accused them before our God day and night. 11 And they overcame him by the blood of the Lamb, and by the word of their testimony; and they loved not their lives unto the death. 12 Therefore rejoice, ye heavens, and ye that dwell in them. Woe to the inhabiters of the earth and of the sea! for the devil is come down unto you, having great wrath, because he knoweth that he hath but a short time. 13 And when the dragon saw that he was cast unto the earth, he persecuted the woman which brought forth the man child. 14 And to the woman were given two wings of a great eagle, that she might fly into the wilderness, into her place, where she is nourished for a time, and times, and half a time, from the face of the serpent. 15 And the serpent cast out of his mouth water as a flood after the woman, that he might cause her to be carried away of the flood. 16 And the earth helped the woman, and the earth opened her mouth, and swallowed up the flood which the dragon cast out of his mouth. 1 And I stood upon the sand of the sea, and saw a beast rise up out of the sea, having seven heads and ten horns, and upon his horns ten crowns, and upon his heads the name of blasphemy. 2 And the beast which I saw was like unto a leopard, and his feet were as the feet of a bear, and his mouth as the mouth of a lion: and the dragon gave him his power, and his seat, and great authority. 3 And I saw one of his heads as it were wounded to death; and his deadly wound was healed: and all the world wondered after the beast. 4 And they worshipped the dragon which gave power unto the beast: and they worshipped the beast, saying, Who is like unto the beast? who is able to make war with him? 5 And there was given unto him a mouth speaking great things and blasphemies; and power was given unto him to continue forty and two months. 6 And he opened his mouth in blasphemy against God, to blaspheme his name, and his tabernacle, and them that dwell in heaven. 7 And it was given unto him to make war with the saints, and to overcome them: and power was given him over all kindreds, and tongues, and nations. 8 And all that dwell upon the earth shall worship him, whose names are not written in the book of life of the Lamb slain from the foundation of the world. 9 If any man have an ear, let him hear. 10 He that leadeth into captivity shall go into captivity: he that killeth with the sword must be killed with the sword. Here is the patience and the faith of the saints. 11 And I beheld another beast coming up out of the earth; and he had two horns like a lamb, and he spake as a dragon. 12 And he exerciseth all the power of the first beast before him, and causeth the earth and them which dwell therein to worship the first beast, whose deadly wound was healed. 13 And he doeth great wonders, so that he maketh fire come down from heaven on the earth in the sight of men, 14 And deceiveth them that dwell on the earth by the means of those miracles which he had power to do in the sight of the beast; saying to them that dwell on the earth, that they should make an image to the beast, which had the wound by a sword, and did live. 15 And he had power to give life unto the image of the beast, that the image of the beast should both speak, and cause that as many as would not worship the image of the beast should be killed. 16 And he causeth all, both small and great, rich and poor, free and bond, to receive a mark in their right hand, or in their foreheads: 17 And that no man might buy or sell, save he that had the mark, or the name of the beast, or the number of his name. 1 And I looked, and, lo, a Lamb stood on the mount Sion, and with him an hundred forty and four thousand, having his Father's name written in their foreheads. 2 And I heard a voice from heaven, as the voice of many waters, and as the voice of a great thunder: and I heard the voice of harpers harping with their harps: 3 And they sung as it were a new song before the throne, and before the four living creatures, and the elders: and no man could learn that song but the hundred and forty and four thousand, which were redeemed from the earth. 4 These are they which were not defiled with women; for they are virgins. These are they which follow the Lamb whithersoever he goeth. These were redeemed from among men, being the firstfruits unto God and to the Lamb. 5 And in their mouth was found no guile: for they are without fault before the throne of God. 9 And the third angel followed them, saying with a loud voice, If any man worship the beast and his image, and receive his mark in his forehead, or in his hand, 10 The same shall drink of the wine of the wrath of God, which is poured out without mixture into the cup of his indignation; and he shall be tormented with fire and brimstone in the presence of the holy angels, and in the presence of the Lamb: 11 And the smoke of their torment ascendeth up for ever and ever: and they have no rest day nor night, who worship the beast and his image, and whosoever receiveth the mark of his name. 12 Here is the patience of the saints: here are they that keep the commandments of God and the faith of Jesus. having on his head a golden crown, and in his hand a sharp sickle. 15 And another angel came out of the temple, crying with a loud voice to him that sat on the cloud, Thrust in thy sickle, and reap: for the time is come for thee to reap; for the harvest of the earth is ripe. 16 And he that sat on the cloud thrust in his sickle on the earth; and the earth was reaped. 17 And another angel came out of the temple which is in heaven, he also having a sharp sickle. 18 And another angel came out from the altar, which had power over fire; and cried with a loud cry to him that had the sharp sickle, saying, Thrust in thy sharp sickle, and gather the clusters of the vine of the earth; for her grapes are fully ripe. 19 And the angel thrust in his sickle into the earth, and gathered the vine of the earth, and cast it into the great winepress of the wrath of God. 20 And the winepress was trodden without the city, and blood came out of the winepress, even unto the horse bridles, by the space of a thousand and six hundred furlongs. Great and marvellous are thy works, Lord God Almighty; just and true are thy ways, thou King of saints. 4 Who shall not fear thee, O Lord, and glorify thy name? for thou only art holy: for all nations shall come and worship before thee; for thy judgments are made manifest. 5 And after that I looked, and, behold, the temple of the tabernacle of the testimony in heaven was opened: 6 And the seven angels came out of the temple, having the seven plagues, clothed in pure and white linen, and having their breasts girded with golden girdles. 7 And one of the four living creatures gave unto the seven angels seven golden vials full of the wrath of God, who liveth for ever and ever. 8 And the temple was filled with smoke from the glory of God, and from his power; and no man was able to enter into the temple, till the seven plagues of the seven angels were fulfilled. 10 And there are seven kings: five are fallen, and one is, and the other is not yet come; and when he cometh, he must continue a short space. 11 And the beast that was, and is not, even he is the eighth, and is of the seven, and goeth into perdition. 12 And the ten horns which thou sawest are ten kings, which have received no kingdom as yet; but receive power as kings one hour with the beast. 13 These have one mind, and shall give their power and strength unto the beast. 14 These shall make war with the Lamb, and the Lamb shall overcome them: for he is Lord of lords, and King of kings: and they that are with him are called, and chosen, and faithful. 15 And he saith unto me, The waters which thou sawest, where the whore sitteth, are peoples, and multitudes, and nations, and tongues. 16 And the ten horns which thou sawest upon the beast, these shall hate the whore, and shall make her desolate and naked, and shall eat her flesh, and burn her with fire. 17 For God hath put in their hearts to fulfill his will, and to agree, and give their kingdom unto the beast, until the words of God shall be fulfilled. 18 And the woman which thou sawest is that great city, which reigneth over the kings of the earth. Babylon the great is fallen, is fallen, and is become the habitation of devils, and the hold of every foul spirit, and a cage of every unclean and hateful bird. 3 For all nations have drunk of the wine of the wrath of her fornication, and the kings of the earth have committed fornication with her, and the merchants of the earth are waxed rich through the abundance of her delicacies. 4 And I heard another voice from heaven, saying, Come out of her, my people, that ye be not partakers of her sins, and that ye receive not of her plagues. 5 For her sins have reached unto heaven, and God hath remembered her iniquities. 6 Reward her even as she rewarded you, and double unto her double according to her works: in the cup which she hath filled fill to her double. 7 How much she hath glorified herself, and lived deliciously, so much torment and sorrow give her: for she saith in her heart, I sit a queen, and am no widow, and shall see no sorrow. 8 Therefore shall her plagues come in one day, death, and mourning, and famine; and she shall be utterly burned with fire: for strong is the Lord God who judgeth her. 9 And the kings of the earth, who have committed fornication and lived deliciously with her, shall bewail her, and lament for her, when they shall see the smoke of her burning, 10 Standing afar off for the fear of her torment, saying, Alas, alas, that great city Babylon, that mighty city! for in one hour is thy judgment come. 11 And the merchants of the earth shall weep and mourn over her; for no man buyeth their merchandise any more: 12 The merchandise of gold, and silver, and precious stones, and of pearls, and fine linen, and purple, and silk, and scarlet, and all thyine wood, and all manner vessels of ivory, and all manner vessels of most precious wood, and of brass, and iron, and marble, 13 And cinnamon, and odours, and ointments, and frankincense, and wine, and oil, and fine flour, and wheat, and beasts, and sheep, and horses, and chariots, and slaves, and souls of men. 14 And the fruits that thy soul lusted after are departed from thee, and all things which were dainty and goodly are departed from thee, and thou shalt find them no more at all. 15 The merchants of these things, which were made rich by her, shall stand afar off for the fear of her torment, weeping and wailing, 16 And saying, Alas, alas, that great city, that was clothed in fine linen, and purple, and scarlet, and decked with gold, and precious stones, and pearls! 17 For in one hour so great riches is come to nought. And every shipmaster, and all the company in ships, and sailors, and as many as trade by sea, stood afar off, 18 And cried when they saw the smoke of her burning, saying, What city is like unto this great city! 19 And they cast dust on their heads, and cried, weeping and wailing, saying, Alas, alas, that great city, wherein were made rich all that had ships in the sea by reason of her costliness! for in one hour is she made desolate. 20 Rejoice over her, thou heaven, and ye holy apostles and prophets; for God hath avenged you on her. Salvation, and glory, and honour, and power, unto the Lord our God: 2 For true and righteous are his judgments: for he hath judged the great whore, which did corrupt the earth with her fornication, and hath avenged the blood of his servants at her hand. 4 And the four and twenty elders and the four living creatures fell down and worshipped God that sat on the throne, saying, Amen; Alleluia. 6 And I heard as it were the voice of a great multitude, and as the voice of many waters, and as the voice of mighty thunderings, saying, Alleluia: for the Lord God omnipotent reigneth. 7 Let us be glad and rejoice, and give honour to him: for the marriage of the Lamb is come, and his wife hath made herself ready. 8 And to her was granted that she should be arrayed in fine linen, clean and white: for the fine linen is the righteousness of saints. and in righteousness he doth judge and make war. 12 His eyes were as a flame of fire, and on his head were many crowns; and he had a name written, that no man knew, but he himself. 13 And he was clothed with a vesture dipped in blood: and his name is called the Word of God. 14 And the armies which were in heaven followed him upon white horses, clothed in fine linen, white and clean. 15 And out of his mouth goeth a sharp sword, that with it he should smite the nations: and he shall rule them with a rod of iron: and he treadeth the winepress of the fierceness and wrath of Almighty God. 16 And he hath on his vesture and on his thigh a name written, KING OF KINGS, AND LORD OF LORDS. 17 And I saw an angel standing in the sun; and he cried with a loud voice, saying to all the fowls that fly in the midst of heaven, Come and gather yourselves together unto the supper of the great God; 18 That ye may eat the flesh of kings, and the flesh of captains, and the flesh of mighty men, and the flesh of horses, and of them that sit on them, and the flesh of all men, both free and bond, both small and great. 19 And I saw the beast, and the kings of the earth, and their armies, gathered together to make war against him that sat on the horse, and against his army. 20 And the beast was taken, and with him the false prophet that wrought miracles before him, with which he deceived them that had received the mark of the beast, and them that worshipped his image. These both were cast alive into a lake of fire burning with brimstone. 21 And the remnant were slain with the sword of him that sat upon the horse, which sword proceeded out of his mouth: and all the fowls were filled with their flesh. 13 And the sea gave up the dead which were in it; and death and hell delivered up the dead which were in them: and they were judged every man according to their works. 14 And death and hell were cast into the lake of fire. This is the second death. 15 And whosoever was not found written in the book of life was cast into the lake of fire. 1 And I saw a new heaven and a new earth: for the first heaven and the first earth were passed away; and there was no more sea. 2 And I John saw the holy city, new Jerusalem, coming down from God out of heaven, prepared as a bride adorned for her husband. and they shall be his people, and God himself shall be with them, and be their God. 4 And God shall wipe away all tears from their eyes; and there shall be no more death, neither sorrow, nor crying, neither shall there be any more pain: for the former things are passed away. 5 And he that sat upon the throne said, Behold, I make all things new. 6 And he said unto me, It is done. I am Alpha and Omega, the beginning and the end. 9 And there came unto me one of the seven angels which had the seven vials full of the seven last plagues, and talked with me, saying, Come hither, I will shew thee the bride, the Lamb's wife. 10 And he carried me away in the spirit to a great and high mountain, and shewed me that great city, the holy Jerusalem, descending out of heaven from God, 11 Having the glory of God: and her light was like unto a stone most precious, even like a jasper stone, clear as crystal; 12 And had a wall great and high, and had twelve gates, and at the gates twelve angels, and names written thereon, which are the names of the twelve tribes of the children of Israel: 13 On the east three gates; on the north three gates; on the south three gates; and on the west three gates. 14 And the wall of the city had twelve foundations, and in them the names of the twelve apostles of the Lamb. 15 And he that talked with me had a golden reed to measure the city, and the gates thereof, and the wall thereof. 16 And the city lieth foursquare, and the length is as large as the breadth: and he measured the city with the reed, twelve thousand furlongs. The length and the breadth and the height of it are equal. 17 And he measured the wall thereof, an hundred and forty and four cubits, according to the measure of a man, that is, of the angel. 18 And the building of the wall of it was of jasper: and the city was pure gold, like unto clear glass. 19 And the foundations of the wall of the city were garnished with all manner of precious stones. The first foundation was jasper; the second, sapphire; the third, a chalcedony; the fourth, an emerald; 20 The fifth, sardonyx; the sixth, sardius; the seventh, chrysolite; the eighth, beryl; the ninth, a topaz; the tenth, a chrysoprasus; the eleventh, a jacinth; the twelfth, an amethyst. 21 And the twelve gates were twelve pearls; every several gate was of one pearl: and the street of the city was pure gold, as it were transparent glass. 22 And I saw no temple therein: for the Lord God Almighty and the Lamb are the temple of it. 23 And the city had no need of the sun, neither of the moon, to shine in it: for the glory of God did lighten it, and the Lamb is the light thereof. 24 And the nations of them which are saved shall walk in the light of it: and the kings of the earth do bring their glory and honour into it. 25 And the gates of it shall not be shut at all by day: for there shall be no night there. 26 And they shall bring the glory and honour of the nations into it. 6 And he said unto me, These sayings are faithful and true: and the Lord God of the holy prophets sent his angel to shew unto his servants the things which must shortly be done. 7 Behold, I come quickly: blessed is he that keepeth the sayings of the prophecy of this book. 8 And I John saw these things, and heard them. And when I had heard and seen, I fell down to worship before the feet of the angel which shewed me these things. 9 Then saith he unto me, See thou do it not: for I am thy fellowservant, and of thy brethren the prophets, and of them which keep the sayings of this book: worship God. 10 And he saith unto me, Seal not the sayings of the prophecy of this book: for the time is at hand. 11 He that is unjust, let him be unjust still: and he which is filthy, let him be filthy still: and he that is righteous, let him be righteous still: and he that is holy, let him be holy still.